This recipe is part of a series of blog posts based on batch cooking and freezing tips. This recipe makes certain assumptions. It assumes you have frozen blanched green beans and cooked mushrooms. It’s also intended to be wicked fast and a nice little side dish. Throw a piece of fish on this and it’ll be an outstanding little dinner! Green Beans: To get to the point where we cook these green beans, they have had their tops and bottoms trimmed off. They were boiled in very salted water for about 2 to 3 minutes, and then they were plunged into ice water until thoroughly chilled. They were then frozen, likely in a zipped plastic or vacuum sealed bag. This recipe assumes they’ve been defrosted in the refrigerator or a bowl of cold water, in the sink. 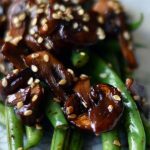 Mushrooms: To get to the point where we cook these mushrooms, they are cremini mushrooms, but shiitake would actually be a better choice (they’re very hard to find where I live). Oyster mushrooms would also be quite nice. They are brushed of any dirt/debris. If they’re shiitake, the stems are removed. They are sautéed over high heat with a neutral tasting fat, like ghee or coconut oil. A small amount of salt is added to them. They are removed and placed into a refrigerator to chill. Once chilled, they are frozen, likely in a zipped plastic or vacuum sealed bag. This recipe assumes they’ve been defrosted in the refrigerator or a bowl of cold water, in the sink. Once you have these chilled ingredients ready to go, the rest goes VERY quickly! In a small bowl, combine sesame seeds, rice vinegar, soy sauce, sesame oil, sweetener, fresh ginger and garlic. Stir and set aside. Pre-heat a sauté pan on the stove, over high heat. Add the ghee or oil to the hot pan and swirl it around. Quickly add the green beans and sauté over high heat for about 30 seconds to a minute. Light browning and bubbling of the greens beans’ surface is ok.
After about 30 seconds of scorching high heat, add the mushrooms. Toss and cook for a further 30 seconds. After the 30 seconds are up, add your soy-sesame mixture and toss the pan around for roughly 1 minute longer. Add chili flakes or black pepper for a little kick, as well as a pinch of salt, if you feel it needs it. Once most of the liquid has evaporated and the ginger and sesame seeds cling to the vegetables, serve ‘em up!